Your To Dos on the Home Page is a list of things for you To Do. These are displayed in chronological order showing the topic, due date, company, main and linked contacts, priority, a complete check box that you can use to complete your To Dos and a trash can. 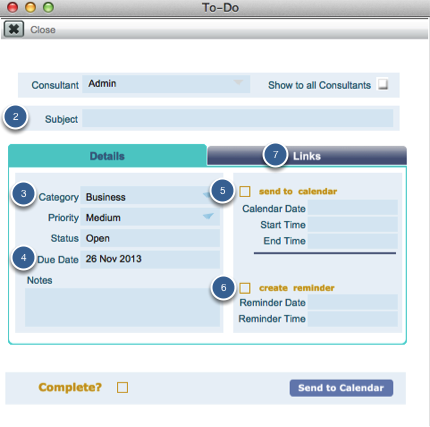 Clicking on the black arrow to the left of the To Do will open the To Do in Form View. The To Dos list can be filtered between To Dos and Call List. Call list are To Dos that have been entered with a category of Call List. To Dos are entered with a category of Business or Personal. 3. Click in the Category field and select Call List if you want the To Do to appear on the Call List filter or Business or Personal if you want it to appear in the To Dos filter. NOTE: If you select the category Call List when creating a To Do, the To Do will appear on the Call List filter. Checking the Show To All Consultants checkbox will make the To Do visible when Communal To Dos is selected in the drop down field in the top right hand corner. You can only view other consultants’ To Dos if you have the necessary privilege.